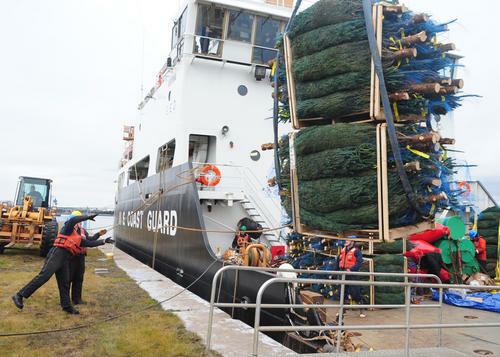 Crew members of the seagoing buoy tender Alder load pallets of Christmas trees Monday in Sault Ste. Marie, Mich. Alder will deliver the trees to needy families in Chicago. // PA3 George Degener/Coast Guard. 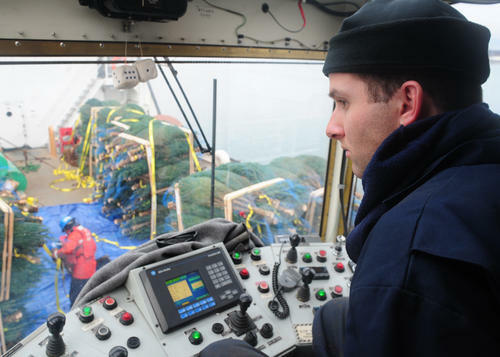 The seagoing buoy tender Alder has a new mission: spreading holiday cheer. The cutter is carrying hundreds of trees to needy Chicago families as the city’s “Christmas ship.” On Monday, the cutter’s crew took on the holiday cargo in Sault Ste. Marie, Mich.
Boatswain's Mate 3rd Class Curt Barrett operates Alder's buoy deck crane to load pallets of trees Monday. // PA3 George Degener/Coast Guard. The seagoing buoy tender/icebreaker Mackinaw normally does the honors. Its crew delivered more than 1,200 Christmas trees to Chicago families last year. But for this holiday season, Mackinaw is headed to a Wisconsin shipyard for repair of a leaking bow-thruster. Alder’s mission is the continuation of a Chicago tradition. The original Christmas ship, the Rouse Simmons, brought fresh evergreens and wreaths to Chicago during holiday seasons in the early 1900s. The three-masted schooner entered port with a Christmas tree tied to its mast each year until it was lost in 1912. Alder is due to arrive in Chicago on Friday morning; trees will be distributed Saturday. In this economy, we are still using our ships and crews to deliver trees to the “needy”in Chicago? Really? A dead tree is not going to feed a family or get them a job. What a waste of taxpayer’s money.